Our wonderful group of crafters! Special thanks to Julia, Judy, Lelani, and Sharon for their help in preparing materials. If you would like to help prep materials, please email me, all materials (including the loan of dies, stamps, and a die cutting machine) will be provided. 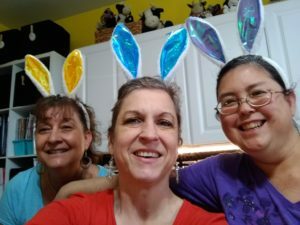 Pictured below: Julia, Loretta and Lelani — complete with rabbit ears provided by sweet Lelani. Julia is our craft club vice president. Thank you for your willingness to serve our group and community! Bobbie, Sara Elizabeth (SEC) Jay, Loretta, Julia and Jill — The final packaging of this months 90 projects. 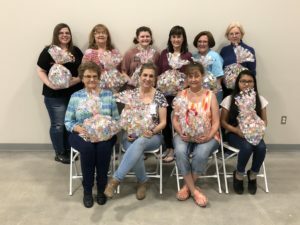 Today, eleven members of the Cove Crafters (Shepherd’s Cove Hospice), met in the new Shepherd’s Cove Thrift Shoppe to assemble Easter-themed gift baskets for our patients. We produced 90 of these adorable Easter projects, which will be distributed to our patients starting April 1, 2019. Each basket contained three hand made elements, One large pinwheel, one small notebook (with a pinwheel on the cover) and a chocolate bunny treat. Each gift also had a small handmade card matching the spring and Easter theme. Someone asked me today how much time I typically spend preparing for the monthly craft meetings, which usually run only 3-4 hours. The fact is, it requires about 80-120 hours of preparation on my part, as well as additional helping hands, to gather materials & hand-craft all the individual parts and pieces that go into each project. The goal is to have each project ready to be individually assembled by our Craft Cove volunteers at the monthly meetings. As president of the Cove Crafters group, I happily facilitate each monthly project. It is such a blessing to be part of this community. One of the most important lessons I have learned is not only humility, but the importance of seeking out and graciously receiving help. In this case, the words “It takes a community…” rings true. I couldn’t do this by myself. With the help of the Cove Crafters wonderful volunteers, the blessings we may give to our hospice patients and their families are returned to each of us a thousand-fold. If you would like more information on supporting Cove Crafters, please send me an email to: Ms.Rhetta@gmail.com. Please put “Cove Crafters” in the Subject line so that I will not mistake your email for spam. Stamp Happy and be a blessing… until next time!